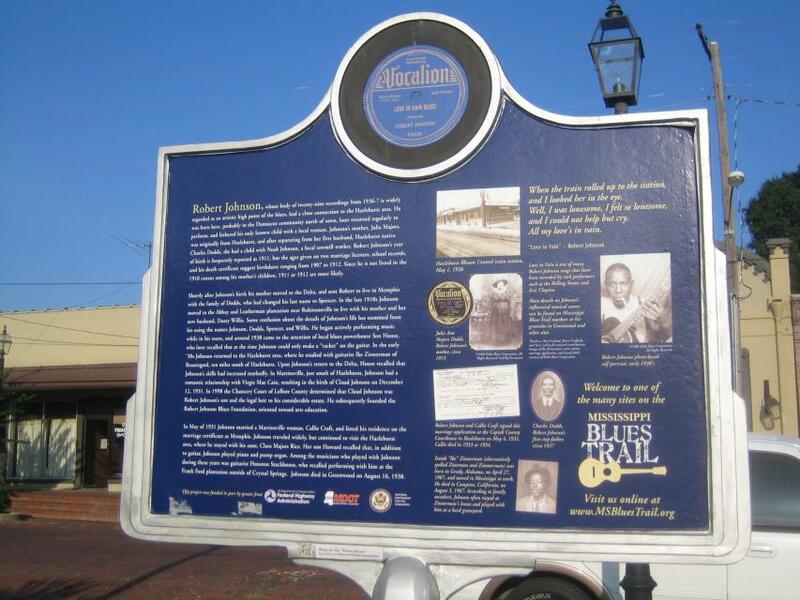 Robert Johnson whose body of twenty-nine recordings from 1936-37 is widely regarded as an artistic high point of the blues, had a close connection to the Hazlehurst area. He was born here, probably in the Damascus community north of town, later returned regularly to perform, and fathered his only known child with a local woman. Johnson's mother, Julia Majors, was originally from Hazlehurst, and after separating from her first husband, Hazlehurst native Charles Dodds, she had a child with Noah Johnson, a local sawmill worker. Robert Johnson's year of birth is frequently reported as 1911, but the ages given on two marriage licenses, school records, and his death certificate suggest birthdates ranging from 1907 to 1912. Since he is not listed in the 1910 census among his mother's children, 1911 or 1912 are more likely. Shortly after Johnson's birth his mother moved to the Delta and sent Robert to live in Memphis with the family of Dodds, who had changed his last name to Spencer. In the late 1910s Johnson moved to the Abbay and Leatherman plantation near Robinsonville to live with his mother and her new husband, Dusty Willis. Some confusion about the details of Johnson's life has stemmed from his using the names Johnson, Dodds, Spencer, and Willis. He began actively performing music while in his teens, and around 1930 came to the attention of local blues powerhouse Son House, who later recalled that at the time Johnson could only make a "racket" on the guitar. 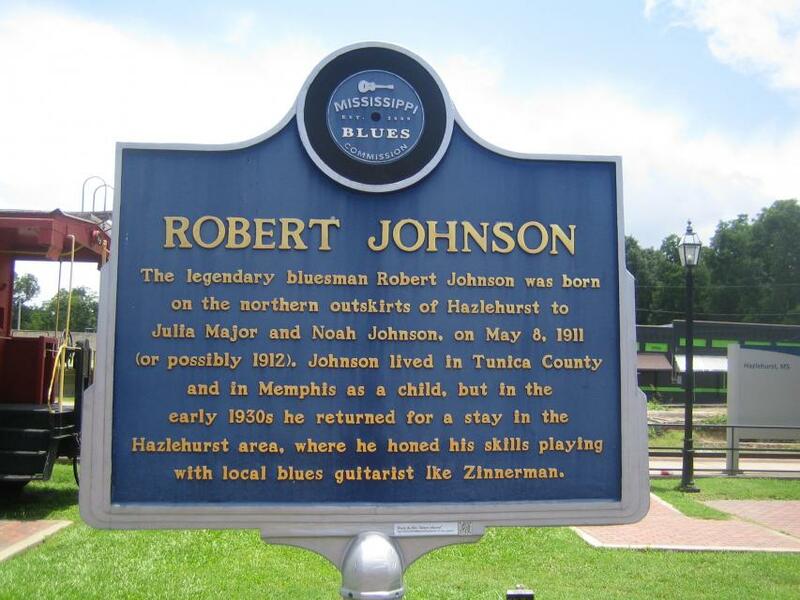 In the early '30s Johnson returned to the Hazlehurst area, where he studied with guitarist Ike Zinnerman of Beauregard, ten miles south of Hazlehurst. Upon Johnson's return to the Delta, House recalled that Johnson's skills had increased markedly. In Martinsville, just south of Hazlehurst, Johnson had a romantic relationship with Virgie Mae Cain, resulting in the birth of Claud Johnson on December 12, 1931. In 1998 the Chancery Court of Leflore County determined that Claud Johnson was Robert Johnson's son and the legal heir to his considerable estate. He subsequently founded the Robert Johnson Blues Foundation, oriented toward arts education. This marker can also be identified by its HM code. You can use the hashtag #HM1IOI in tweets, and any other place where you might refer to this marker, including when searching on this site.